You wake up early to catch the waves. Next, you have eggs benedict on homemade bread for breakfast. You spend the afternoon lounging in the infinity pool before having lunch over looking the water. Next you hit the spa for a Warm and Cold Sea Stone Massage. Afterwards you relax in your own private hammock. In the evening you listen to light jazz while you eat the fresh fish creation of the day. Then fall asleep to the sound of the waves. Welcome to the Cabo Surf Hotel! 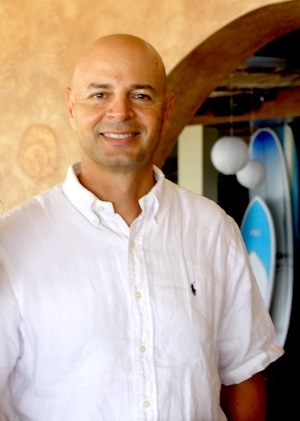 Mauricio Balderrama, general manager and one of the owners of the Cabo Surf Hotel, gave us some insider tips about the hotel. When was the Cabo Surf Hotel established? We started the hotel back in 1996 after we bought a beach house in this location. We added a few more rooms and turned the beach house into an 8 room villa. […]We started as a bed & breakfast back then. Amenities were a jacuzzi and breakfast in the morning. 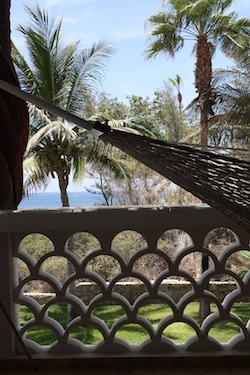 What makes the Cabo Surf Hotel different from other Cabo hotels? The location and size. I think if we wanted to find a location like this to build another hotel, it wouldn’t be there. We have the waves, the views. Also being small, having 22 rooms and a fine restaurant, spa and surf school adds to the experience. Cabo is very safe and we don’t have the violence that is found in some cities in Mexico. It is not an issue, but we also have a security gate. We make sure that no one gets in that is not one of our clients or guests. Do you have a favorite room or suite? The villas. They have the best views. One time Adam Sandler came by and he wanted to see the place. I took him to the master villa. When the girl staying there with her family opened the door she was so surprised to see Adam Sandler asking to see the room. It was funny. You are located right on the beach – can you swim at the beach? We are lucky to be located on a reef so that the waves break before reaching the shore. That makes for a gentle easy place to swim. This is not the cause for most of the Cabo beaches because the waves breaks right onto the beach and creates an undertow and can be very dangerous. If you would like to enjoy a swim, this is the place to be. April to November. I would say you have good surfing during those months, but even so we get waves all year round for beginners. So people can surf during New Years Eve, spring any time. If I have never surfed before, can I get a one on one personal lesson? Yes. We are so flexible with the school. If two of you want a group lessons – you have a group. You don’t have to wait. If you want to have a private lesson, that means the instructor will be with you personally. It’s a little higher in price but it’s worth it. All of the surf instructors have 3-5 years giving lessons here. They are certified by the National Surf Schools and Instructors Association. Have any famous surfers stayed at the Cabo Surf Hotel? Dino Miranda. He’s a famous long boarder. Have you stayed at the Cabo Surf Hotel? Tell us about it!